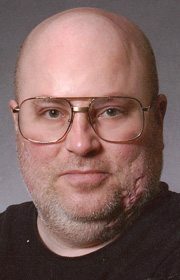 David B. Chalfant, 49, of Fort Dodge, died Thursday, November 30, 2017, at his home. A service honoring David’s life will be 10:00 a.m. Monday, December 4, at the Gunderson Funeral Chapel with the Rev. Chadric Dietrich officiating. Interment, with military honors, will be 4:00 p.m. Monday at Oakland Cemetery at Moulton. Visitation is 9:00 a.m. until service time Monday at the Gunderson Funeral Home & Cremation Services. Memorials may be directed to the discretion of the family. David is survived by his siblings, Diane (Mark) Chalfant-Drury, Urbandale; Ricky Chalfant and Jennifer (Flavio) Ramirez, all of Fort Dodge; nieces and nephews, Lucia, Ronica, Talia, Damon, Ravon, Tyler and Heath; and other family members and friends. He was preceded in death by his parents. David Brian Chalfant, the son of Richard and Jean (Dwight) Chalfant, was born September 28, 1968, in Stuttgart, Germany. The family lived on a farm near Moorland and he attended Prairie Schools at Gowrie. The family later moved into Fort Dodge. David served in the United States Navy. Following his discharge, he was employed at Was Broken Pallet Company until becoming disabled from his service while in the military. David enjoyed music, adult coloring books, watching movies and all things related to engines, cars and guns. He especially treasured time spent with his family.